I love nothing more than finding something for free and making it work in my home. So I decided to give my free little dresser a makeover. I painted it a lovely robin's egg blue and added one of my favorite details...numbers...to each drawer. You can read all about how I revived this little dresser here. A little while later, I was lucky enough to happen upon another dresser on the curb. This dresser was in pretty sad shape, but it had a couple of drawers that looked pretty good, and the detailing was lovely, so I rescued the two drawers and brought them home. I painted one with a single coat of white paint. I purposely didn't give the drawer more than one coat because I wanted it to look aged. I painted over the lock as well but then sanded it down to emphasize the pretty details. 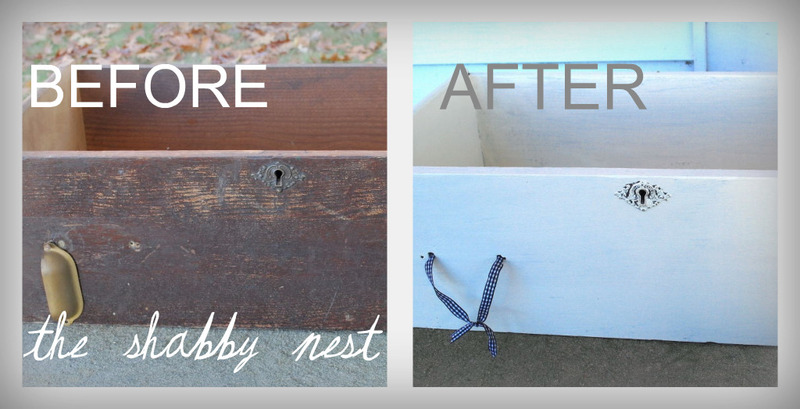 You can read all about how I repurposed the drawer here. It's sister sat in the "before" state until I finally got my act together this last week, and refinished it in the same way as the first. Since the pulls on the drawers were a little worse for the wear, I added some fun ribbon in a brown polka dot. With an open closet like this one, the storage has to not only be functional...it has to be attractive. Adding the sweet numbered dresser and the two rehabbed drawers, creates storage with personality befitting my fun boys' sock monkey bedroom. Thank heavens for found dressers!! I've got lots of fun decorating projects coming up in the near future...so STAY TUNED!! 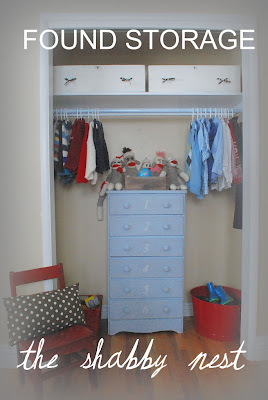 Man I wish my closets looked like that! Total awesomeness. Great job!!! Looks so adorable! Very creative - and free! All my favorite stuff is free! ;) Love the Robin's egg blue! Hey Gwendiliniwinifred,... I miss you already! !...and the kiddos...sigh. Until June........that's not so long right?? That is one fab dresser! Your drawers up above are a wonderful idea and your fun ribbons make it that much more unique! Haha, I just had a mental image of your street, the curbs lined with dressers waiting to be rescued. 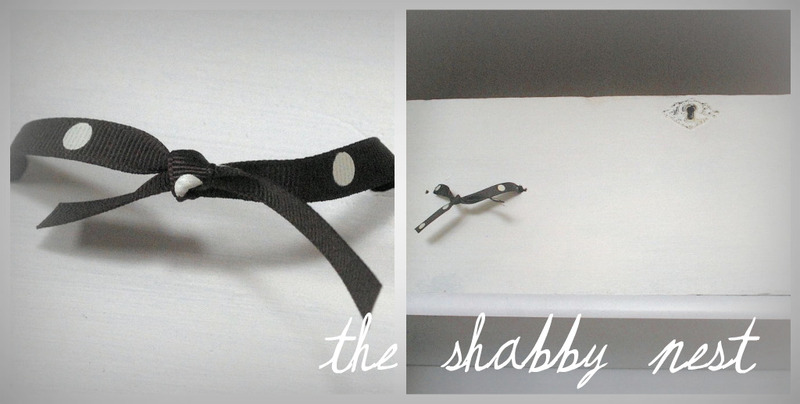 What great finds and you've done such a fabulous makeover on them. Really nice makeover! 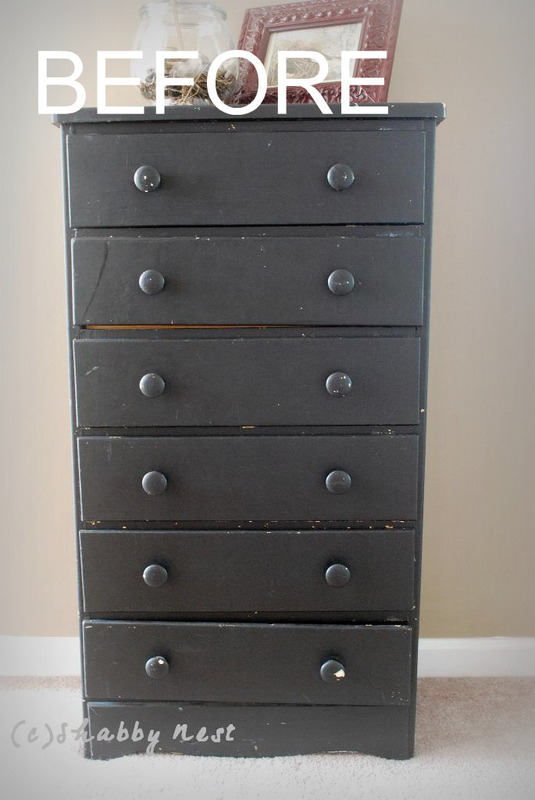 Thanks for the inspiration for a little chest of drawers that I have been meaning to get working on! love this! i had forgotten about the ribbon trick. i want to try that w/ my girl's dresser. 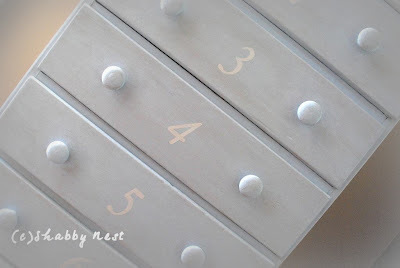 I love the numbers on the drawers. And the ribbon ties, so cute! Love it! I basically was given the same dresser! Transforming it now! Wow! I see so many who say they found furniture on the curb. Where do you all live? Really, I have never seen such a thing. I wish that I did though. It would seem like some magical gift bestowed by a benevolent God! The make over looks great. Cant wait to see what you do next. In the mean time I'll keep my eyes on the curb side! Apparently there is treasure there! Beautiful job! What a transformation. I love it! Feel free to stop by this week's Bargain Brag Wednesday, and link this project up!